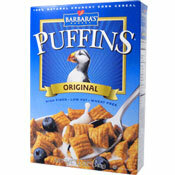 This cereal is described on the front of the box as "crispy berry-kissed seven whole grain cereal squares." It's a little bit weird. The initial taste of berry is impressive. By the third or forth bite, that flavor starts to feel strangely artificial. As you eat more, the berry flavor just seems to be a general tangy sweetness getting in the way of the best part of the cereal - the whole grain (mostly corn) flavor under the dusting of berry flavor. The cereal pieces stay fairly crisp in milk, but they turn mushy in the mouth after the first chew. You have to use your tongue to dig cereal out of the crevices in your teeth. Admittedly, I'm nitpicky when it comes to cereal texture. I wrote recently that Kellogg's FiberPlus Antioxidants cereals were irritating because you could sense a certain chalkiness after a few bites. Most cereal lovers who commented on that review called me crazy. 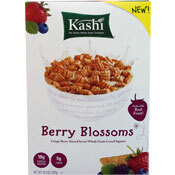 Well, I might be crazy... but I'm not crazy about Kashi's Berry Blossoms. For a much better Kashi berry cereal experience, try their Summer Berry Granola. Nutritional Considerations: Each 3/4 cup serving of Berry Blossoms has 100 calories, 1 gram of total fat (0 saturated and 0 trans), 25 total carbs, 5 grams dietary fiber, 7 grams sugars and 2 grams protein. 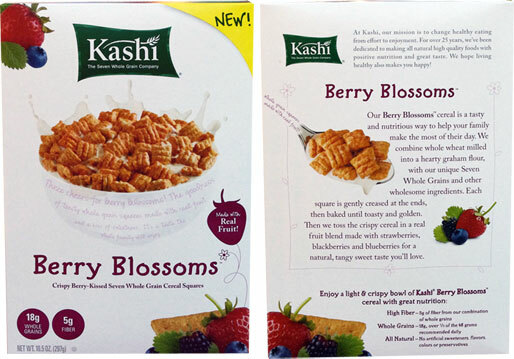 What do you think of Kashi Berry Blossoms? This cereal is great! I get what you mean about the first bites being the best. But the entire bowl is good to me. Light berry taste. Similar to Berry Berry Kix. Soggy. Too much sugar. Fakey taste.